a follow-up webinar series on specific chemical regulatory concepts. The overall objective of the program was to link regulator knowledge with practical application. It was designed to enhance regional economic integration in chemicals through knowledge sharing, capacity building, and regulatory cooperation and convergence. 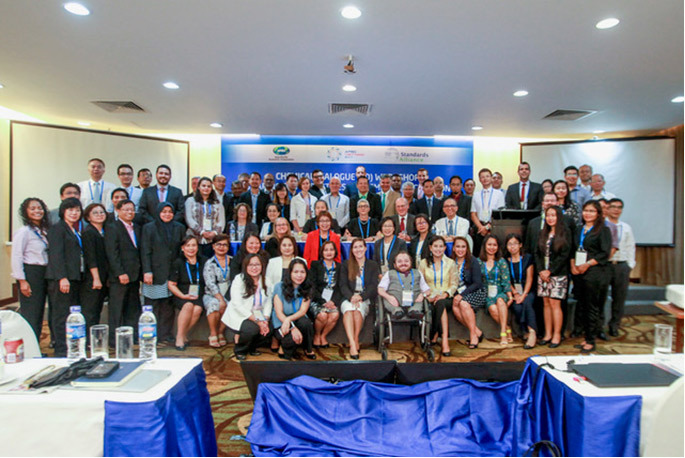 Workshop participants were able to exchange information on best practices in the sound management of chemicals, in order to increase the capability and capacity of developing economies. 13 APEC member countries attended the event including over 75 participants presenting public and private sector organizations, i.e., the Australian Government Department of Health, Ministry of Health of Chile, the Federation of Thai Industries, United States Environmental Protection Agency (EPA), U.S. Department of Labor, OMB OIRA, BOYSEN, ASTM International and many more. The Standards Alliance engagement with Viet Nam provides an important means of fostering the increasingly significant economic relationship between the U.S. and Viet Nam. According to the Vietnam General Department of Customs, Vietnam has a trade surplus with nearly $13.4 billion in export revenue and more than $4.6 billion in import value. The US remains Vietnam’s biggest trading partner in the region, with export-import turnover rising 20 percent to $13.9 billion in the reviewed period.